Do you have an over drive button your car? Have you used it? Many people have an over drive button on their car and simply do not even know it's there. If they do know it's there, they don't know what it's for. So what does it do? The over drive button, which is typically located on the gearshift itself of an automatic transmission vehicle, is there to allow the driver of an automatic transmission car to put the automatic transmission into manual transmission mode. Therefore, when the over drive button is pushed, you are turning OFF automatic transmission. This allows the driver to then manually select the transmission gear in which they wish to drive. So why would you have this over drive button on an automatic transmission? That's a question most automatic transmission vehicle owners ask at one time or another. Especially since most automatic car owners purchase their vehicle because it has an automatic transmission and they even spend extra money for the automatic transmission. It only makes sense to wonder why you would want to take your vehicle out of automatic mode and put it into the manual mode. Obviously, putting your automatic transmission vehicle into the manual transmission mode is not as fuel-efficient. One of the advantages of an automatic transmission vehicle is that it allows for maximum fuel efficiency because the engine automatically switches the gears at the optimal RPMs for the best fuel efficiency. 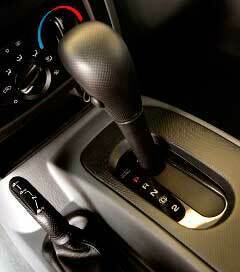 In addition, the automatic transmission works optimally to ensure less wear and tear on the transmission. There is some confusion regarding the overdrive button on your car in that the button seems to operate backwards of a traditional button. What does that mean? Since most buttons are pushed to TURN ON a button; in the case of the overdrive button on your automatic vehicle, the button actually turns OFF the over drive thus putting the car in manual transmission mode. This is slightly confusing to some drivers. However, it should be noted that most vehicles have a light on the dashboard that indicates whether the car has been taken out of over drive mode letting you know if the over drive button has been depressed. So why might you need to push your over drive button and put your automatic vehicle into manual transmission mode? Though, technically, pressing the over drive button and placing the vehicle in manual transmission mode would allow you to place the vehicle in another gear for times like when driving on a steep hill or towing a vehicle, most of this could be accomplished by simply shifting gears without disengaging the over drive. However, turning off the over drive by pushing the button is a common choice for those that are towing. Turning off the over drive allows you to put less stress on the engine while towing and increases the engine torque which allows you to tow more efficiently. As you can see, most drivers will likely never have cause to disengage their over drive by pressing the over drive button. If you do have an occasion to press your over drive button, it is likely due to towing another vehicle, a trailer or a boat and probably towing while on an increased grade hill. Nevertheless, if you do find yourself in a situation where you wish to disengage the over drive and place your car in manual transmission mode, it is best to do so for only the length of time that is necessary to accomplish the task. Automatic transmission vehicles are meant to work most efficiently in automatic transmission mode and should be kept there most of the time in order to work properly and get the best engine and fuel efficiency possible.